MediaPack 202 VoIP Telephone Adapter, 2 FXS including two FXS lines, SIP, 1 WAN port, 1 LAN port, internal Router with Firewall, including G.711/723.1/726/727/729AB Vocoders. As a member of the MediaPack series of gateways, the MP-20x series of Telephone Adapters are well-suited for commercial VoIP deployments. Field-proven voice and fax technology and a feature- rich design make these Telephone Adapters an excellent choice for Voice over Broadband (VoBB) service providers and operators. Designed for Residential and SOHO IP Telephony The MP-20x series is designed for the rapidly growing residential and Small Office/Home Office (SOHO) VoIP market. The MP-20x series typically connects to an existing Broadband Internet device (cable, DSL modem or fixed wireless), and establishes a communications path with the service provider network via its IP Uplink connection. Supporting a rich set of subscriber calling features such as caller ID, call forwarding, and call waiting, the MP-20x series maintains a uniform user experience when migrating to VoIP services. In addition, the MP-20x series serves as a router, supporting connectivity of home PC Networks. 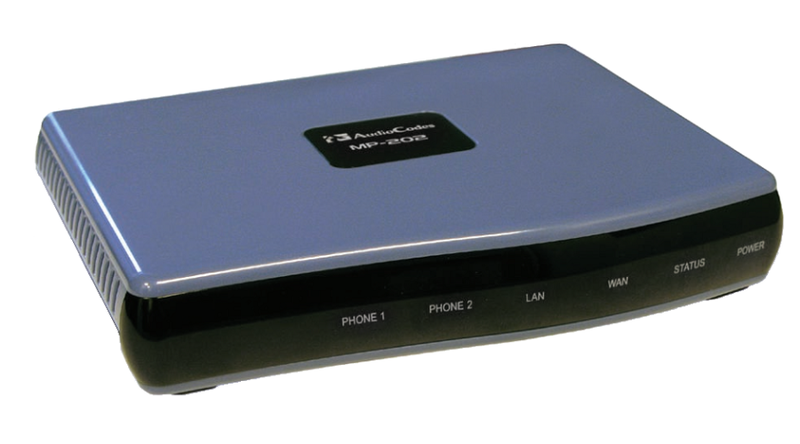 Benefit from Extensive Experience Utilizing AudioCodes' VoIPerfect™ core architecture, and gaining from its accumulated experience in providing IP telephony solutions, the MP-20x series combines superior voice quality and cutting-edge features for end users, such as T.38 Fax Relay and G.168-2004 compliant Echo Cancellation. Low bit rate vocoders (voice coders) can be used simultaneously on all the telephony ports to save valuable bandwidth. Interoperability The MP-20x series is designed for interoperability with leading Softswitches and SIP servers for deployment in various network environments.